Associate theater Prof. Harvey Young and Jewish Studies Prof. Phyllis Lassner speak Wednesday evening at “Creative Expression as a Form of Remembrance: A Panel Discussion on Art and the Holocaust.” The panel, hosted by “The Lilliput Troupe," focused on forms of storytelling appropriate for depicting the Holocaust and why telling Holocaust stories continues to serve an important purpose. 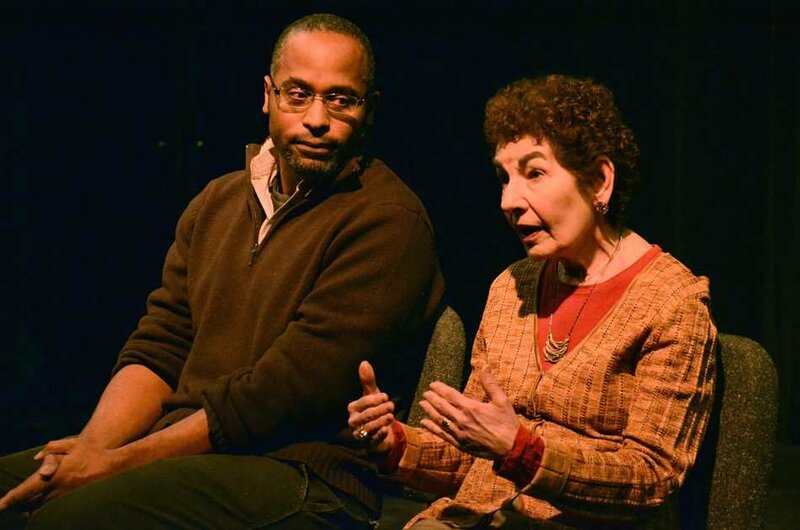 The team behind the upcoming performance of “The Lilliput Troupe” held a panel Wednesday discussing the role of theater and art in remembering the Holocaust. The panel, which was moderated by Lillian Gerstner (Communication ’73), director of special projects at the Illinois Holocaust Museum and Education Center, was held in the Theatre and Interpretation Center and drew about 50 people. Other panel members included Writing Program Prof. Phyllis Lassner, associate theatre Prof. Harvey Young and English and theatre Prof. Tracy C. Davis. “I think to the extent that theater can bring a narrative, personalized depiction of any story of genocide sensitively rendered, to an extent is asking to provoke debate as well as learning,” Davis said. “The Lilliput Troupe,” which was written by Communication senior Gaby FeBland, is based on a true story about the lives of the Ovitz family, a Jewish family of traveling musicians from Romania. Seven members of the family were dwarves and were sent to Auschwitz during the Holocaust. While at Auschwitz, Josef Mengele, infamous for his human experimentation, subjected them to his tortures. Remarkably, the entire family survived the ordeal and continued performing. The new play chronicles a vaudeville performance after their liberation that showcases their time in the concentration camp. The show, which is produced by Vertigo, will run from April 24 to 26. Lassner explained that theater remained an important part of Holocaust victims’ lives. She said performances continued in the ghettos and concentration camps, despite the Nazi goal of destroying Jewish culture. “Different media can narrate and interpret Holocaust history, particularly by focusing on specific events or on survivors and second and third generations of survivors,” she said. The panel also discussed the growing trend of depicting the Holocaust through theater, leading to the creation of the Holocaust Theater Archive, which aims to research, catalogue, produce and record works produced during World War II, and new works performed in remembrance of the Holocaust. The Archive is run by the National Jewish Theater Foundation. Remembrance has also spread to public art as several countries throughout Europe are installing raised Stolpersteine, or stumbling stones, outside the former addresses of victims and survivors of the Holocaust. While survivors like Elie Wiesel explain that it is impossible for people to truly understand the horror of the Holocast, Lassner believes the survivors can help us gain better knowledge. She said working with the survivors is the best way to get as close to understanding what happened as possible.